Rainbows can be hard to catch. They are ephemeral and can slip away in the blink of an eye. It takes a certain kind of day and weather conditions to see one. But what if you want to see a rainbow now? There are several ways to create your own rainbows without having to wait for just the right day. 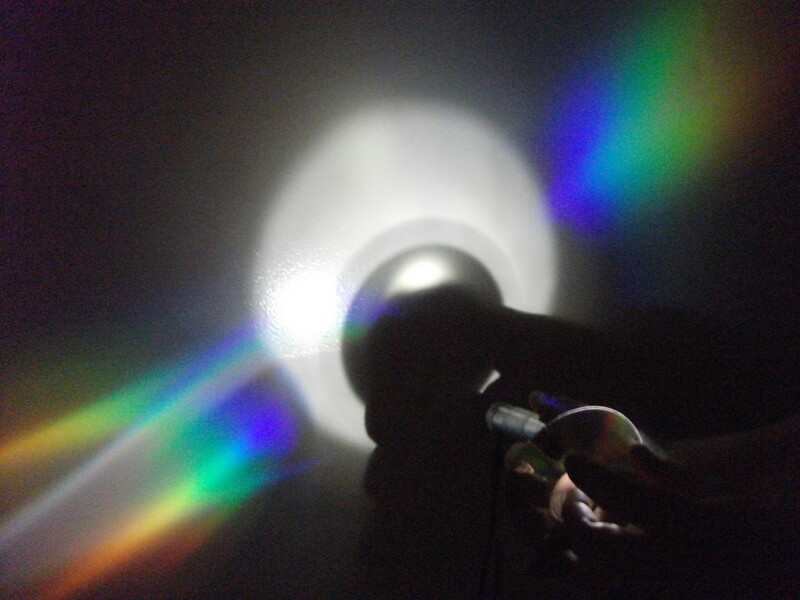 You can make a rainbow on a windowsill, rainbows in the dark, and rainbows in the backyard using simple things like water, a mirror, and a flashlight. 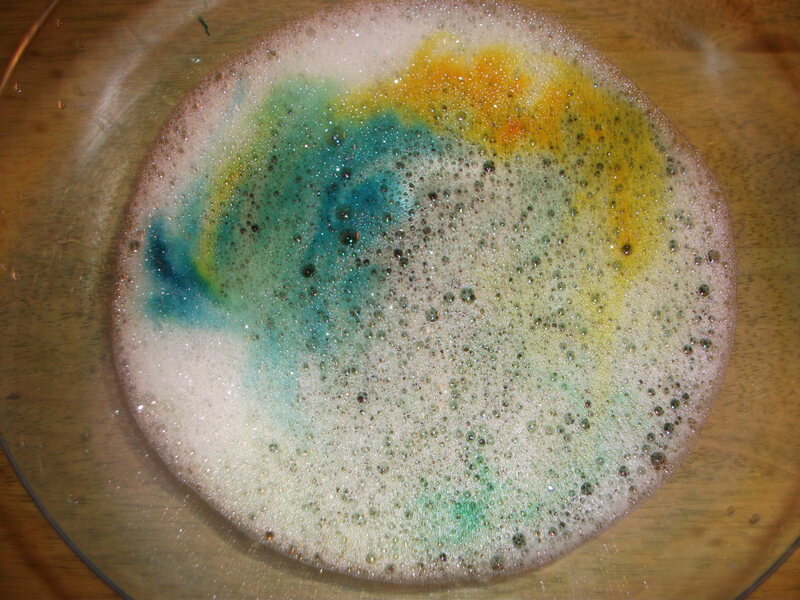 You can create rainbows from CDs and crystals and even swirl rainbows in your milk. There are lots of other colorful things to do with rainbows, so don't wait for a lucky rainbow day. Make your own rainbows today. The key to catching a rainbow is knowing how rainbows are made. So, here is a basic explanation of how a rainbow is created. Light is made up of seven colors. 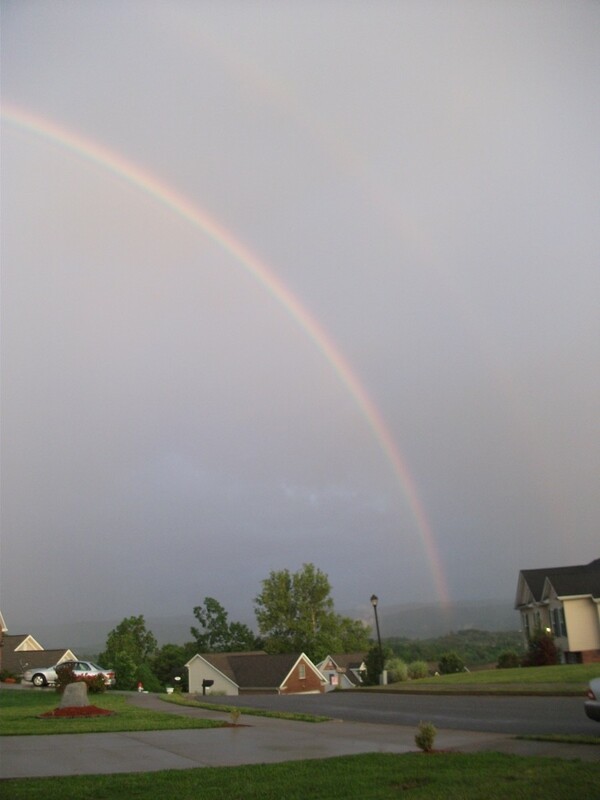 A rainbow is formed when light is bent (refracted) and the colors are separated. Each of the colors bend at a different angle, which is why they spread out into a rainbow. 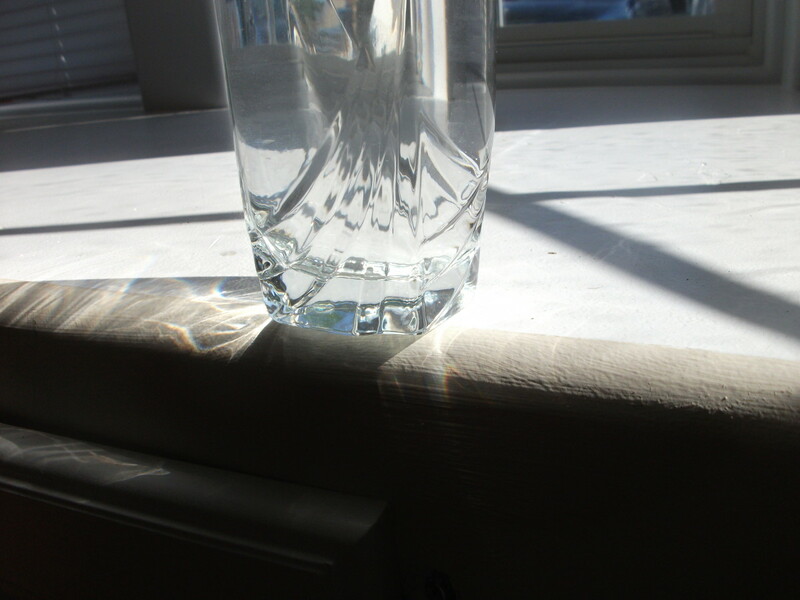 This bending of light happens most often when light shines through water droplets. That’s why we see rainbows on rainy days. 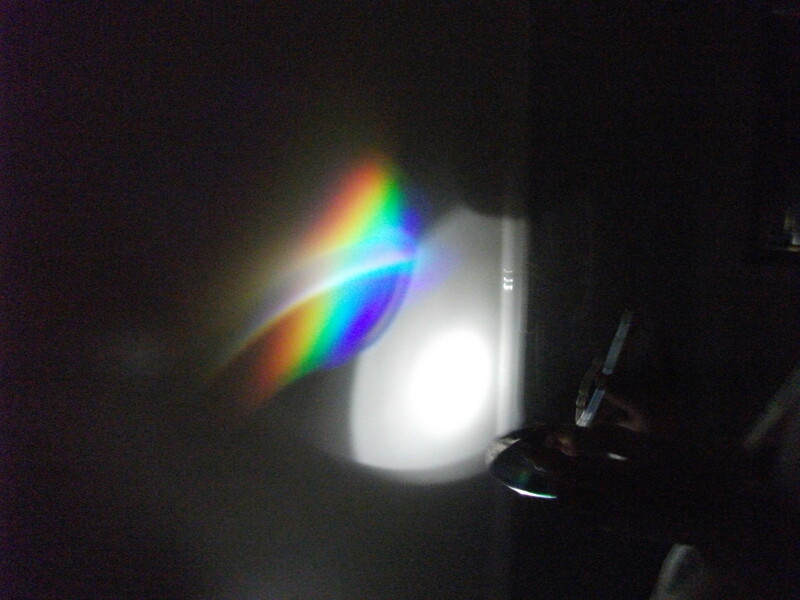 The experiments below are different ways that light can be bent so that we can see the visible spectrum, or a rainbow. The rainbow is on the wall to the right of the bowl. The rainbow made by the sun and the mirror in the water. Look all around the bowl. Rainbows could be in more than one spot. The rainbow is on the wall to the left this time. 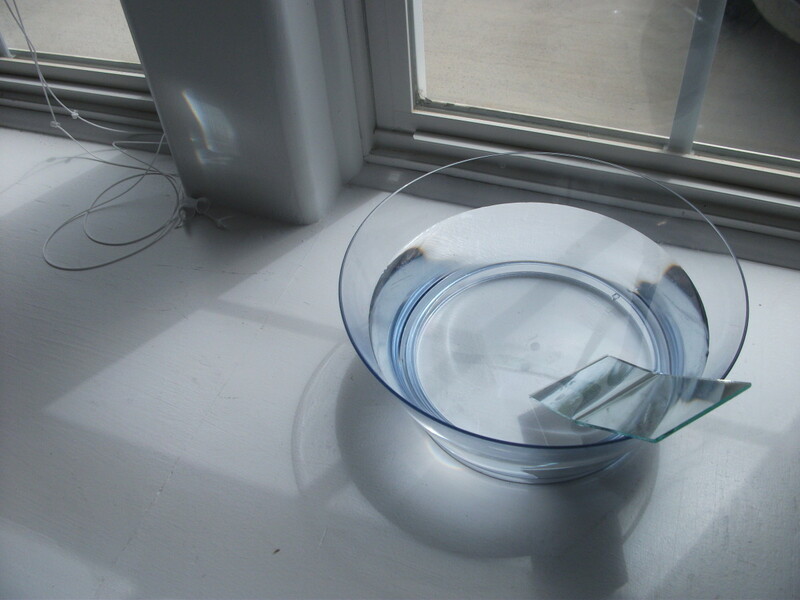 On a sunny day, fill a clear bowl about ¾ of the way full of water. 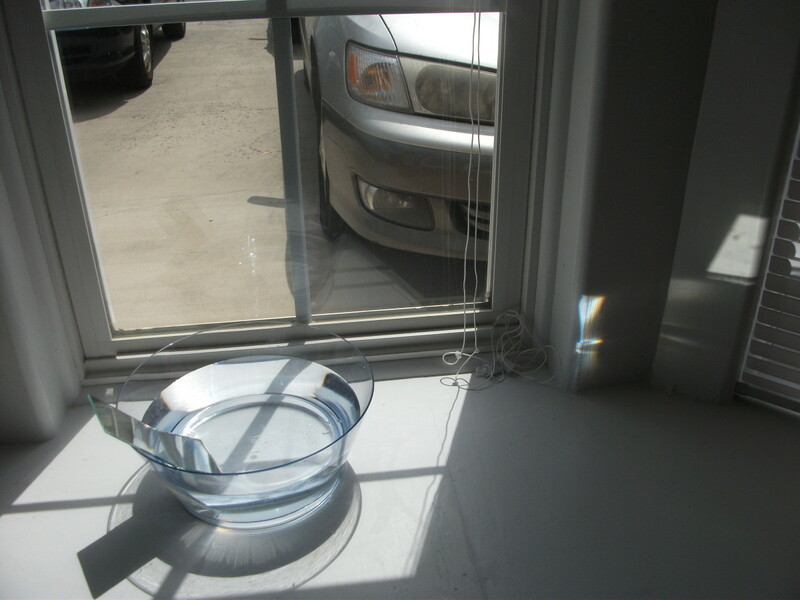 Place the bowl on a window ledge that is facing the sun. Put the mirror into the water so it is standing at about a 45o angle and is pointed toward the sun. Look around the room on the walls, ceiling, and floor for rainbows. If you don’t see any, adjust the mirror in the water until the sun is shining on it. Keep moving the mirror until you create a rainbow. You may have to wait for more direct sunlight if it isn’t working. Why does this make a rainbow? The water acts like a prism and breaks down the white sunlight into separate colors. The mirror reflects the colors forming the rainbow. 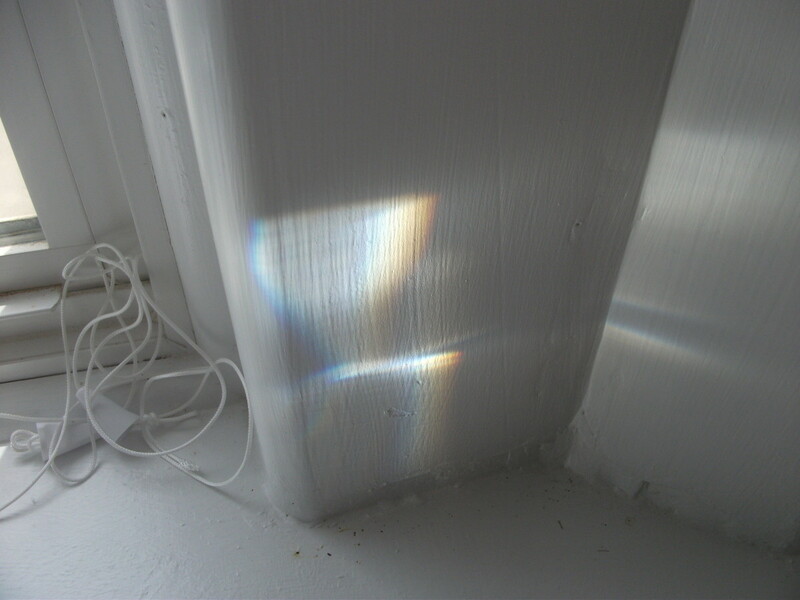 Dampen the window with water if you are having trouble making a rainbow. Fill a clear glass most of the way full with water. Put the glass onto a sunny window ledge so that it is hanging over the edge. Just make sure it is balanced and won’t spill. 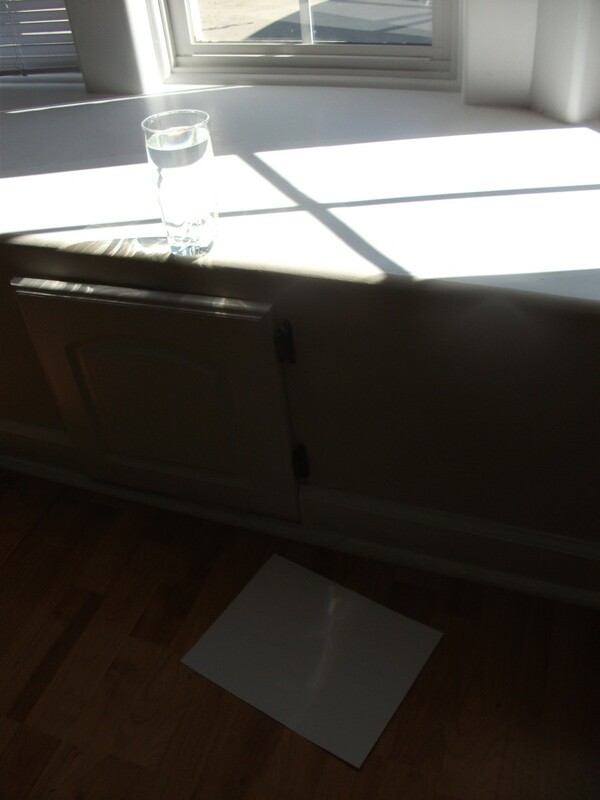 Put a piece of white paper on the floor below the glass. You should be able to see a rainbow on the piece of paper. If you are having trouble finding the rainbow, try moving the paper around. Make sure there is sunlight shining directly onto the glass. 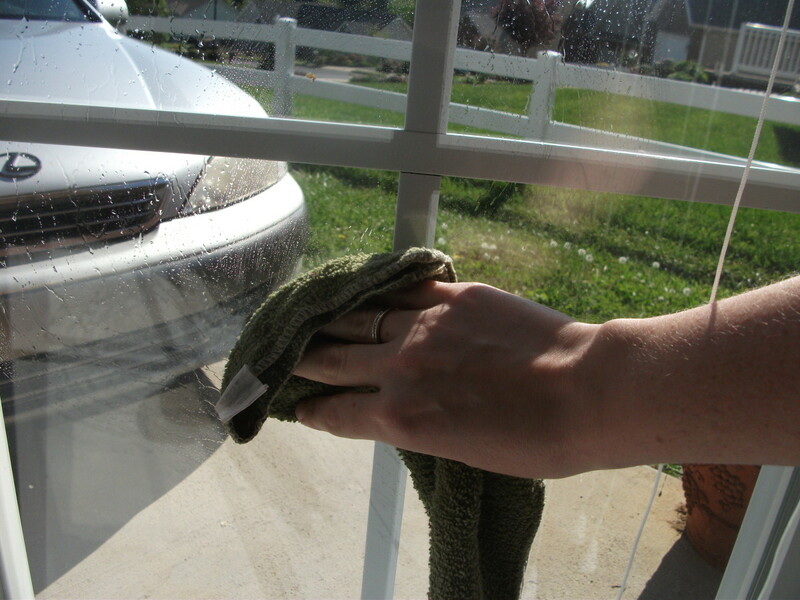 Using a cloth, you can also try wiping warm water onto the window glass. This will help bend the light. 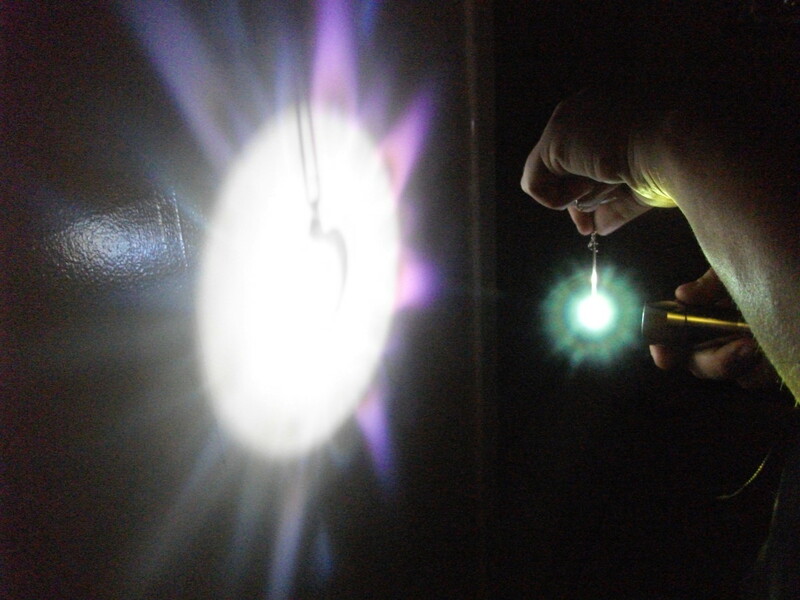 Shining a flashlight through the glass can also form a rainbow. 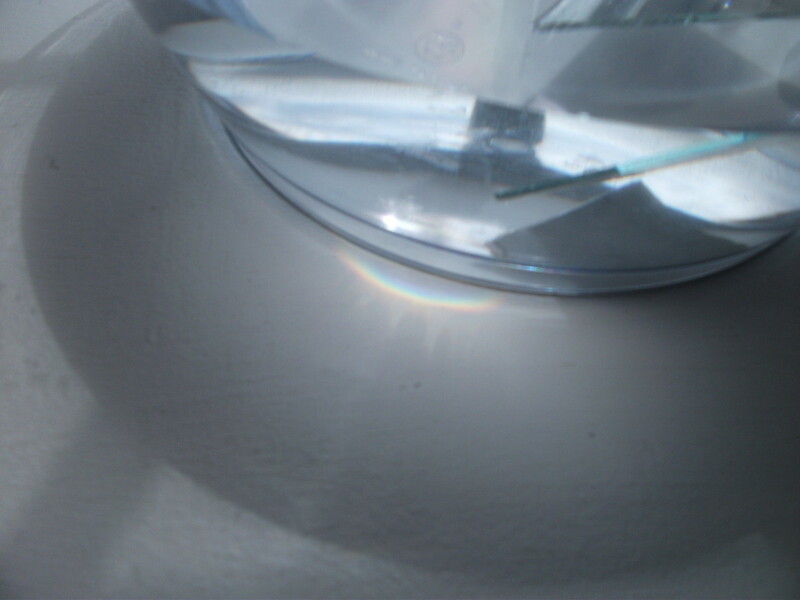 Like the previous experiment, this makes a rainbow because the water is acting like a prism splitting the light into the visible color spectrum. 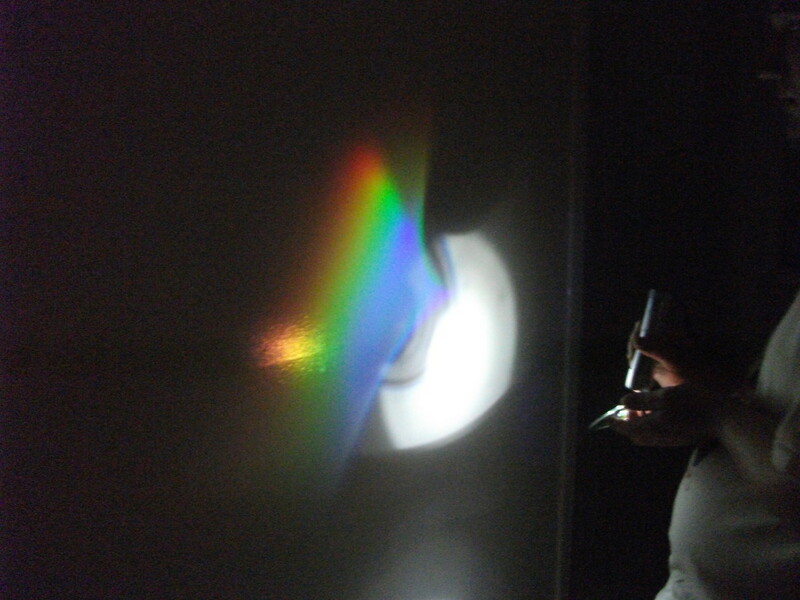 Making rainbows using a flashlight, bowl of water, and a mirror. Rainbows will appear on the walls. The good thing about this experiment is that you don't have to wait for a sunny day to try it. You don't even have to do it during the day. Go into a dark room. It doesn't have to be pitch black, but the darkness helps to see the rainbows a bit more clearly. Fill the bowl about 3/4 of the way full of water. Stick the mirror into the water so that it is standing up at about a 45o angle. Some types of mirrors will have permanent water spots if they get wet, so find a mirror that isn't valuable. Shine the flashlight through the water aiming for the mirror. Now look on the walls, floor, and ceiling for rainbows. How many did it make? How many of the seven rainbow colors do you see? If you don't see a rainbow, tilt the mirror more. You may need to aim the flashlight differently as well. Keep adjusting till you create a rainbow. 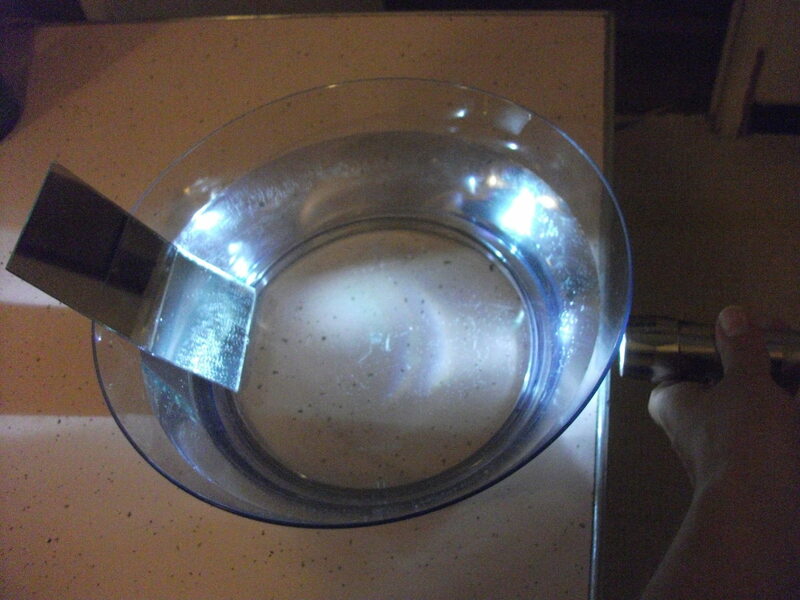 Just like the earlier experiments, the water breaks up the light from the flashlight into its component colors. The mirror bounces the colors back onto the wall. 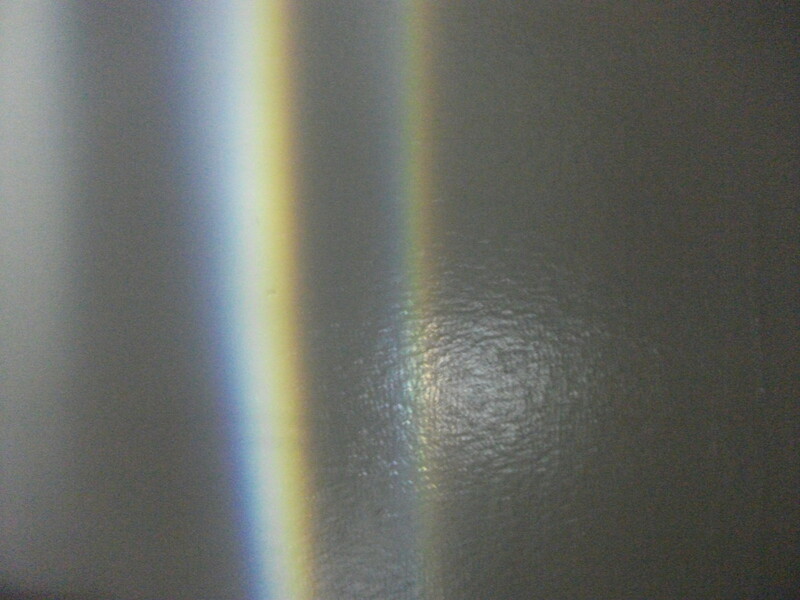 A rainbow reflecting on each side of the CD. Hold the flashlight about an inch from the CD. This is my favorite way to catch a rainbow, mainly because it is the most effective and makes the brightest rainbows. The rainbows will look brighter and be easier to see if you do this in a darkened room. But you will still be able to see the rainbow even in the sunlight. The backside of CD's are very reflective. You can see rainbows on them without having to do anything else. 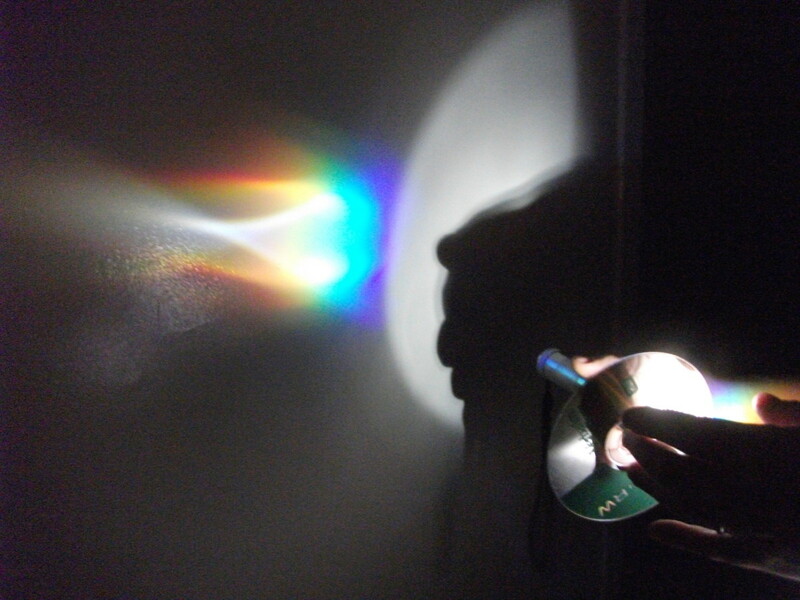 But if you shine a flashlight onto a CD, the rainbows will be magnified. It will show up the best if you point the CD at a white wall. Then hold the flashlight about an inch from the CD and turn it on. Move the flashlight around on the CD to make different shapes with the rainbows. Can you make one rainbow color become wider than the others? Can you make two or more rainbows? 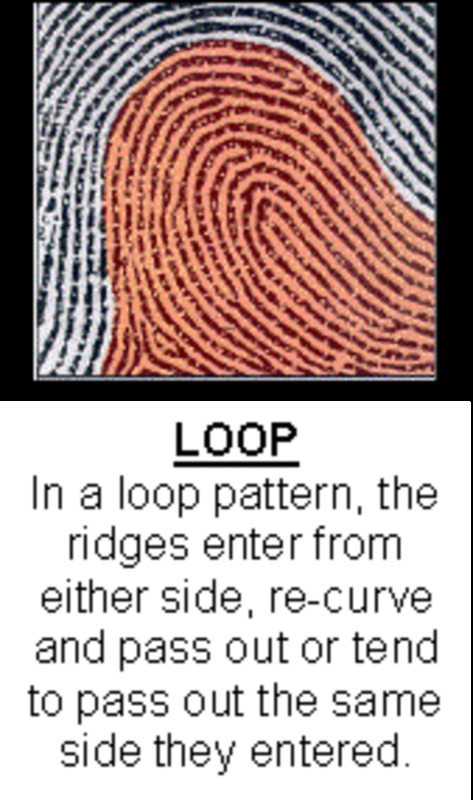 What kind of patterns can you make? Why can you see a rainbow on a CD? The CD is made of a reflective plastic-coated aluminum. 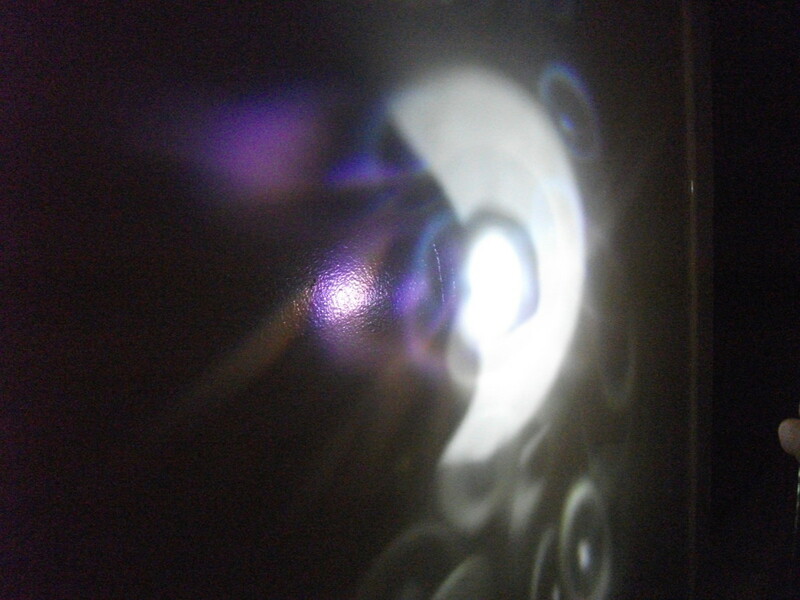 There are small ridges all along the CD, which break up the white light when it shines onto it. The rainbow shows up best in the shadowed area. This is probably the most familiar way of making rainbows. On a sunny day, go outside and play with a garden hose. The best times of day to catch a rainbow are early morning before 9am and late afternoon after 4pm when the sun is lower in the sky. To form a rainbow, you will want the water to be a mist. So, if the garden hose has a nozzle, turn it so that the water is coming out in a fine mist. If you don't have a nozzle attachment, put your finger over the hose so that the water is coming out in as fine of a mist as possible. You may get a bit wet trying this out. Stand with your back to the sun. Spray the water onto a dark surface like a driveway or the grass. Quickly spray the water in a large arc. Look for rainbows. 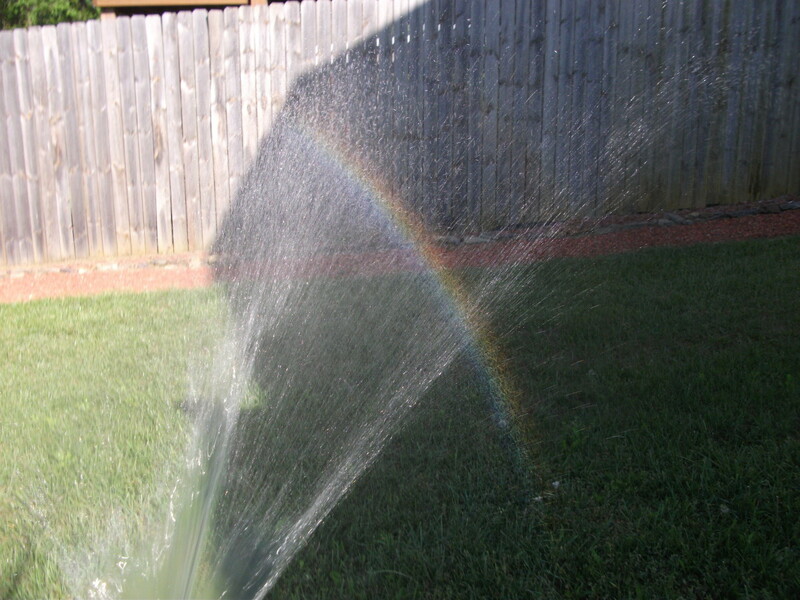 If you can spray the water quickly enough, you might be able to see a full circle rainbow. You may have to crouch down so your own shadow doesn't block the rainbow. Try pointing the hose down at a low angle. How are full circle rainbows possible? Normally the horizon blocks the view of the bottom half of rainbows in the sky. But if you are looking down from an airplane, you can see the full circle. So the amount of a rainbow circle you can see depends on your viewpoint. What is the most amazing rainbow you have ever seen in the sky? Just a normal one arc rainbow. I've seen a double rainbow! A triple or more rainbow. I've seen a full circle rainbow from above. I have never seen a real rainbow in the sky. 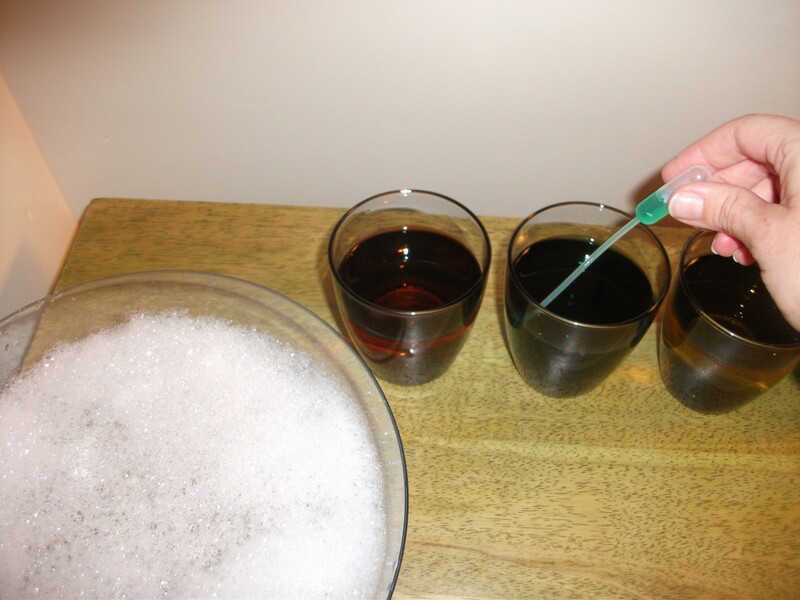 Let kids explore the colors of the rainbow by mixing up and playing with colorful water. 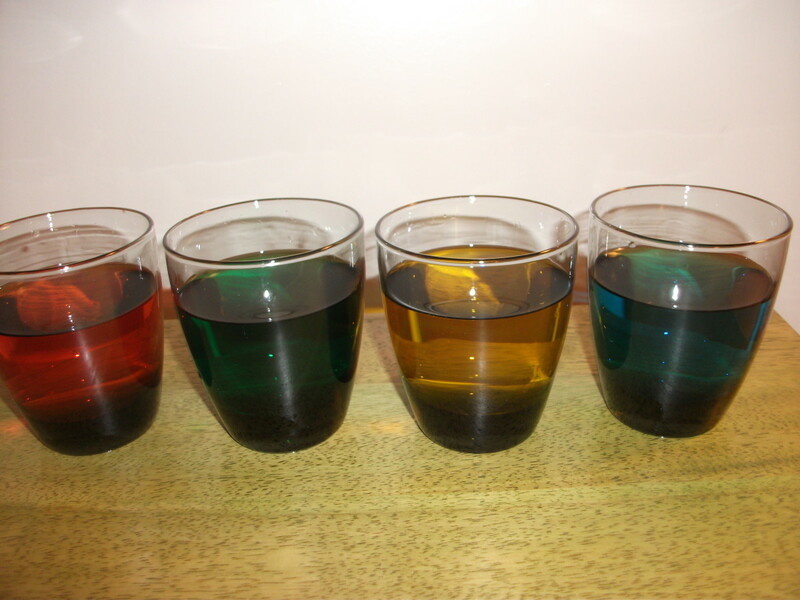 Pour a few drops of food coloring into several cups to make several different colors of water. Try to make all seven rainbow colors. 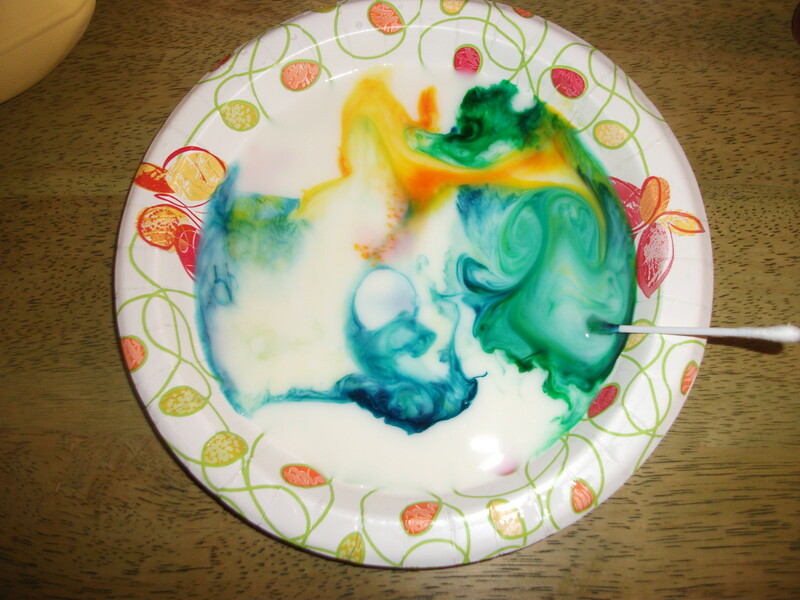 Have your kids mix the water colors together in the bowl with the dropper to form new colors. What happens when you mix up all the colors? You can add dish liquid and water to the bowl. 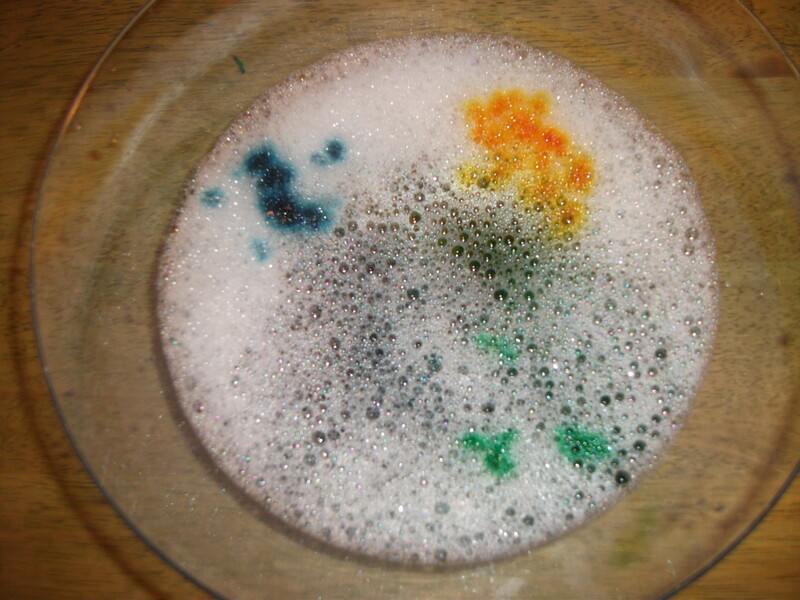 Drop a bit of food coloring onto the foam and let the kids mix it around. Make a rainbow picture using ice. 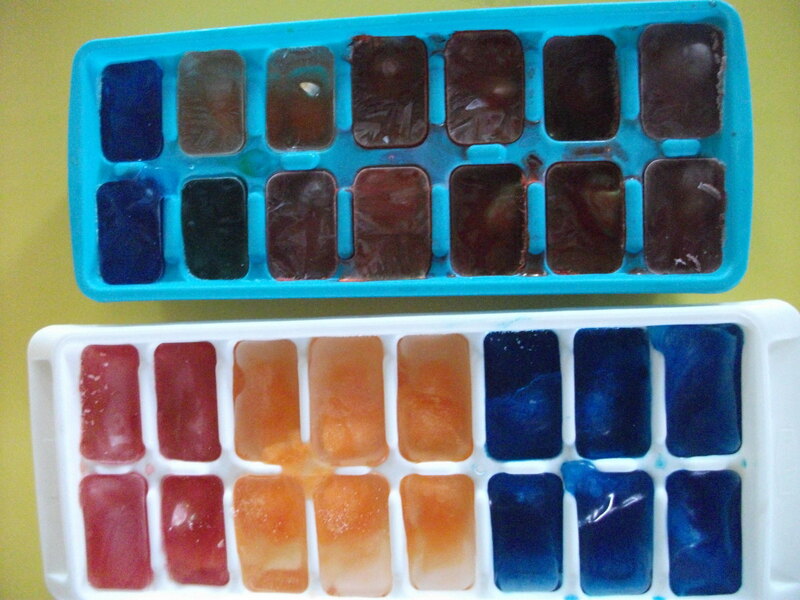 Just pour some of the colored water into ice trays. Let it freeze. Then go outside and put a piece of paper on a table or on the driveway or sidewalk. Put a few pieces of ice onto the paper and let it melt. The food coloring may leave marks, so let the ice melt on a surface that won’t be damaged. When the ice has melted away, you will have a rainbow colored picture. Mix rainbow colors in your milk. Pour some milk onto a plate. 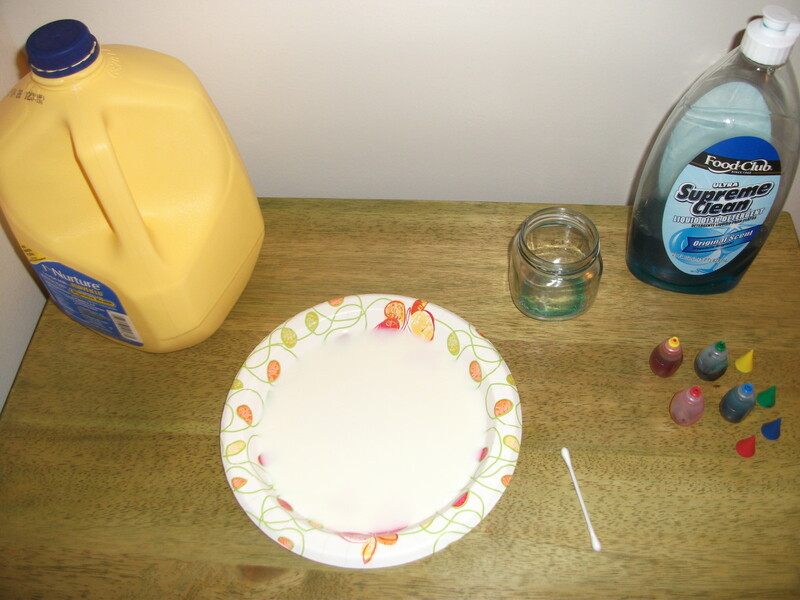 Add a drop of red, blue, green, and yellow food coloring onto the milk close to the middle. Dip the q-tip into the dish liquid. Now dip the q-tip into one of the spots of food coloring. The colors will begin to run and mix. Keep dipping the q-tip into the spots of color to see the rainbow of colors forming. You can see full circle rainbows with this crystal. 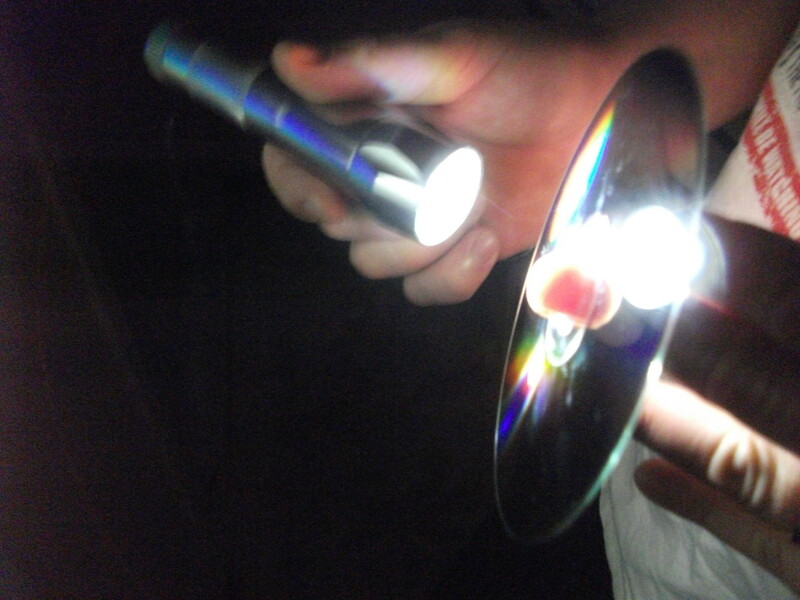 You can shine a flashlight onto a prism or crystal to form rainbows. It will show up best in a dark room. Suncatchers can also make rainbows. Craft stores often have suncatchers you can paint yourself. 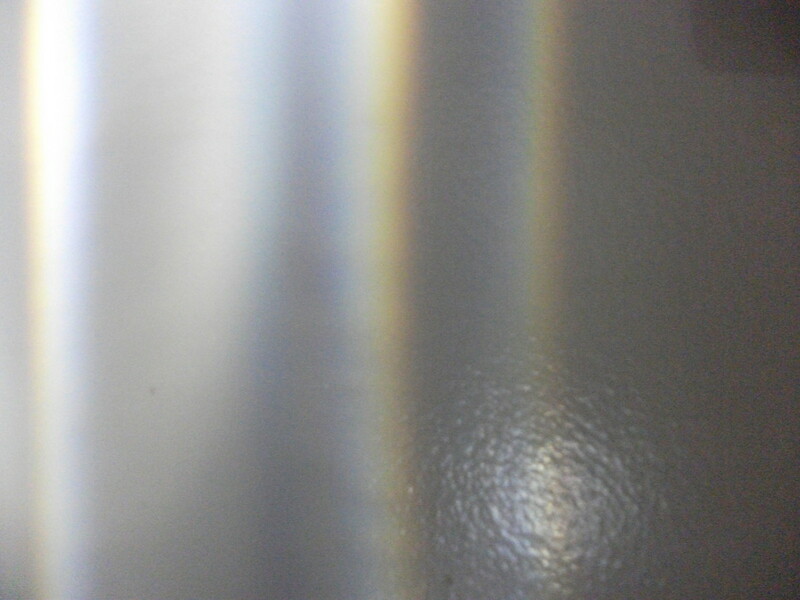 Mirrors with beveled edges can create rainbows when the light hits them. Find songs about rainbows for kids to sing. "Over the Rainbow" and "The Rainbow Connection" are good ones to use. There are lots of kids songs about the colors of the rainbow as well. Skittles are fun to play with when you are studying rainbows. You can put one of each color of Skittles in a baggie for each child so that they can eat a rainbow. Make a rainbow art project with sharpie tie die. Did you know you can make fire change color? Create a rainbow assortment of fire colors with the link below. Or you can buy colored fire crystals that you simply add to a fire. You can spritz a flame with chemicals to change the color of the fire. Colored fire spray bottles are easy to prepare and use common chemicals. Want an easy way to remember the colors of a rainbow? Meet Roy G. Biv. The letters of his name spell out the colors. Did you know that you can see rainbows reflected from light on bubbles? Discover how to make glow in the dark bubbles, how to freeze bubbles, how to create square bubbles, how to light bubbles on fire, and even how to hold bubbles in your hand. 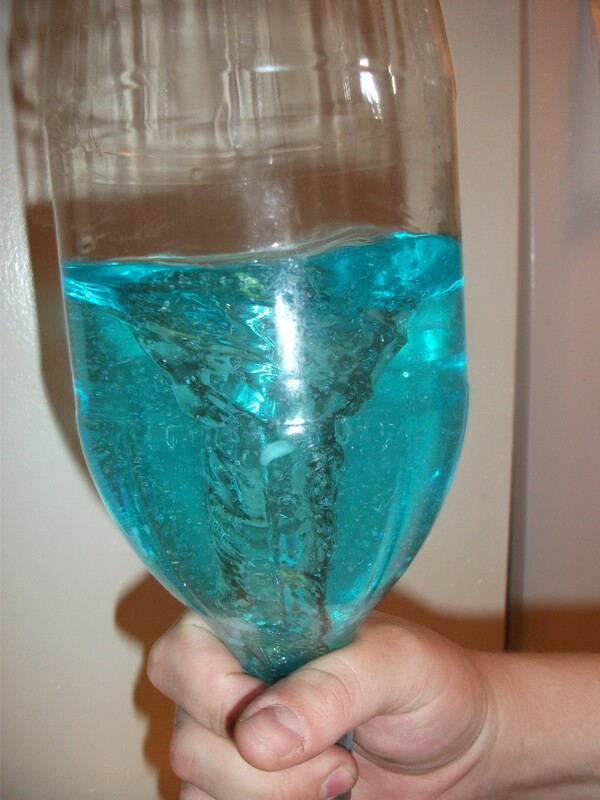 Step by step instructions and demonstration of how to make tornado experiments. 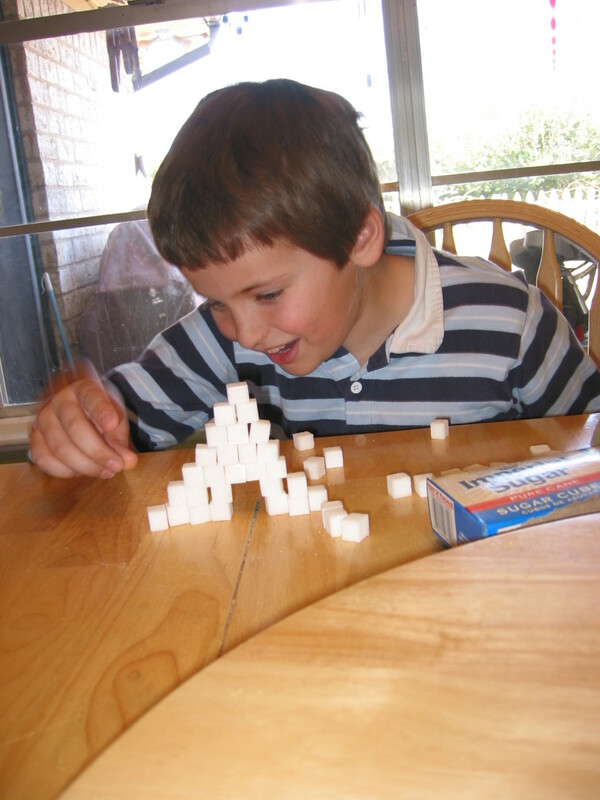 Create a tornado in a bottle, a tornado in a jar, do a speed test on tornadoes, and even do an experiment to see how tornadoes form. watergeek - I'm on the east coast, so that might be a bit hard for me to swing. It sounds like it could have been a really great experience, though. Are you located in Southern California, by chance? This would be a great demonstration to do for the Children's Water Education Festival in Orange County. It's held in March every year and I can put you in touch with its organizers, if you like. Marcy Goodfleisch - Thanks! Sorry your kids didn't get to enjoy it. Thanks for the pin! This is so neat - I wish I'd had this information when my kids were little; they would have loved it! Voted up and up, and Pinned! thebookmom - Those are two of my favorites as well. Who says you can't play with your food. Thanks! Heather Says - Roy G Biv is a well known guy (ha ha). Thanks! mary615 - Thanks so much! Nare Anthony - Thank you! That would make my day! Cre8tor - Wow! Thanks! 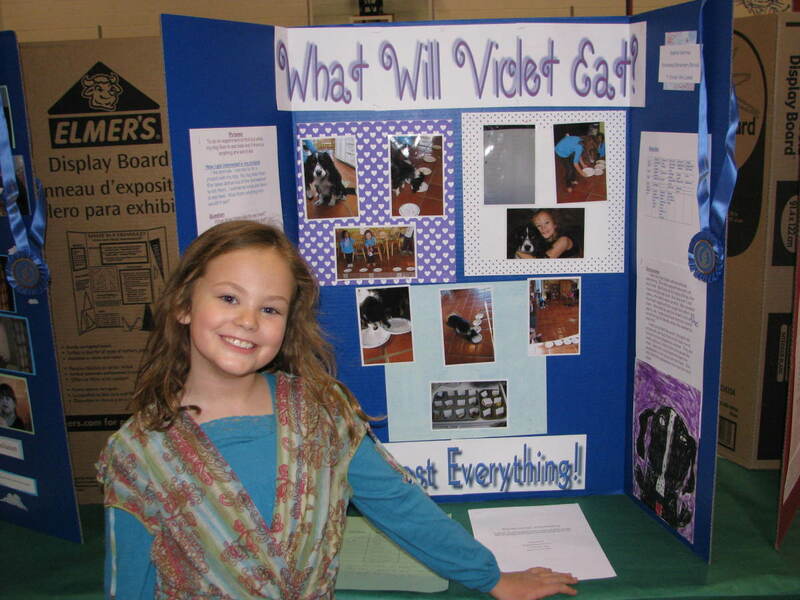 I love to do science projects that are disguised as fun. That's what gets kids inspired about learning. Thanks again. habee - Hope you have some colorful fun with it. Thank you! kidscrafts - It is magical to see rainbows. They are bits of color that seem to appear out of thin air. Thanks so much! I love rainbows...it's like magic! You explained very well! Voted up and interesting! I love rainbows! I'll have to try your experiments with the grandkids. Voted way up! I am such a Coco fan! I love your hubs! 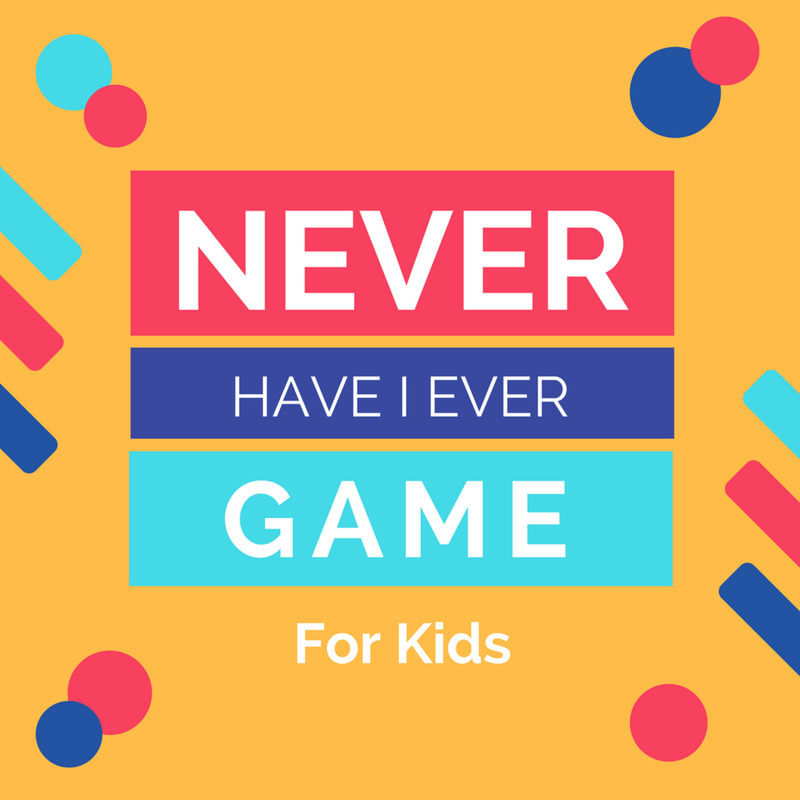 You give my family lots of easy, fun, and interesting things to do that fit the ages of all of my sons. Thanks for sharing. Wow! 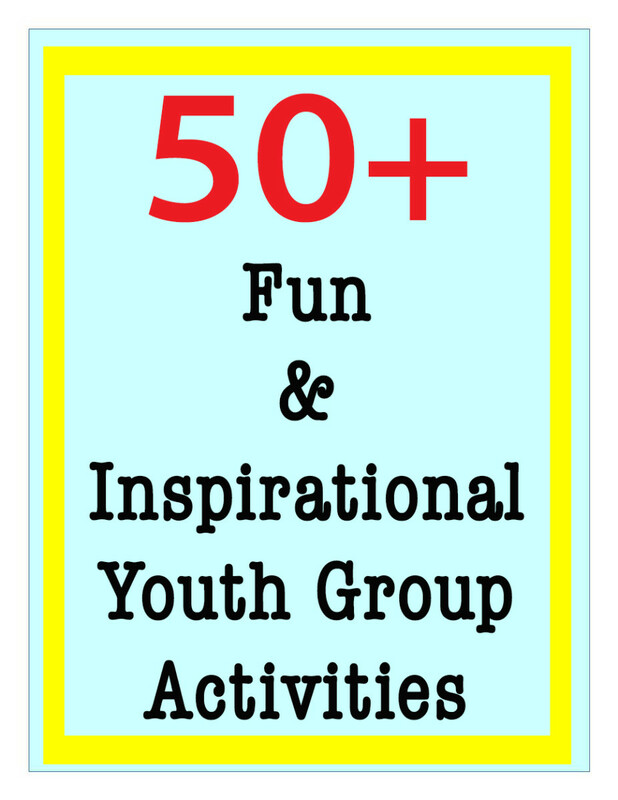 What a great Hub just full of new ideas on making a rainbow. Thanks for all this info. I vote it UP. Roy G Biv definitely brought back memories! Great hub! Such an information packed hub. I love all the ideas but my favorite are the dark room rainbow and the changing milk colors, can't wait to try them out. Thanks so much for writing, well done.